Sydney-based renewable energy technology company BioPower Systems (BPS) has completed the construction of its prototype wave power unit to be installed off the coast of Port Fairy, Victoria, later this year. 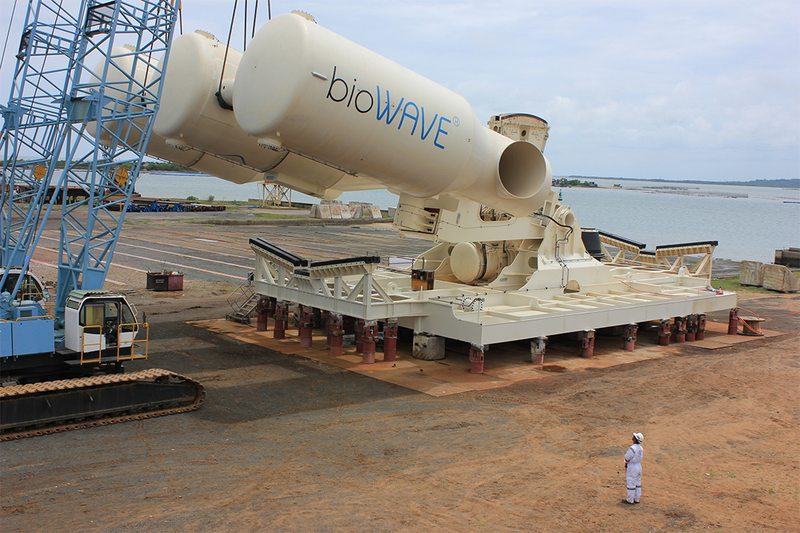 The $21 million project, supported by $11 million Australian Renewable Energy Agency (ARENA) funding, aims to move BPS’ bioWAVE technology towards commercialisation. The project was also supported with a $5 million grant from the Victorian Government and $5 million equity from BPS. BPS had been working on the technology since 2006. 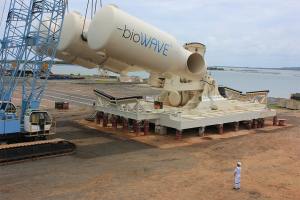 According to the company’s press release, the unique bioWAVE comprises a 26-metre tall oscillating structure that sways back-and-forth beneath the ocean swell, capturing energy from the waves and converting it into electricity fed into the grid via an undersea cable. The design was inspired by undersea plants and the entire device can lie flat on the seabed out of harm’s way during bad weather. “Achieving practical completion of the bioWAVE is a major milestone in the development of this technology,” said the CEO of BPS, Dr Timothy Finnigan. ARENA CEO Ivor Frischknecht welcomed the announcement, pointing out that once installed, the wave power unit will be the second ARENA supported device to supply wave energy to a major Australian grid, feeding 250 KW into the National Electricity Market. “The site near Port Fairy is in the final stages of preparation for the arrival of the completed unit, with the onshore electrical equipment in place and divers working on subsea power and data cabling,” said Mr Frischknecht. BPS is commercialising wave and tidal energy products that incorporate revolutionary designs based on the concept of biomimicry. Its ocean energy products are specifically designed to naturally avoid extreme forces, using light-weight construction, resulting in significant cost savings. The proprietary BPS bioWAVE, bioSTREAM and O-Drive products are intended for use in scale-able multi-device arrays, and are well-suited for supply to remote or isolated grid locations.